June 13th, 2017, Vancouver, British Columbia: Evolving Gold Corp. (CSE: EVG) (FSE: EV7) (OTCB: EVOGF) (the “Company”) is pleased to announce it has acquired, by map staking, a package of 57 claims located next to Osisko Mining’s Quevillon Property, which the Company has named the Nicobi Property (the “Property”). The acquired claims have similar geology to Osisko’s Quevillon Property. Multiple geochemical anomalies located glacially down-ice from the Property indicate a possible source located within these mineral claims. 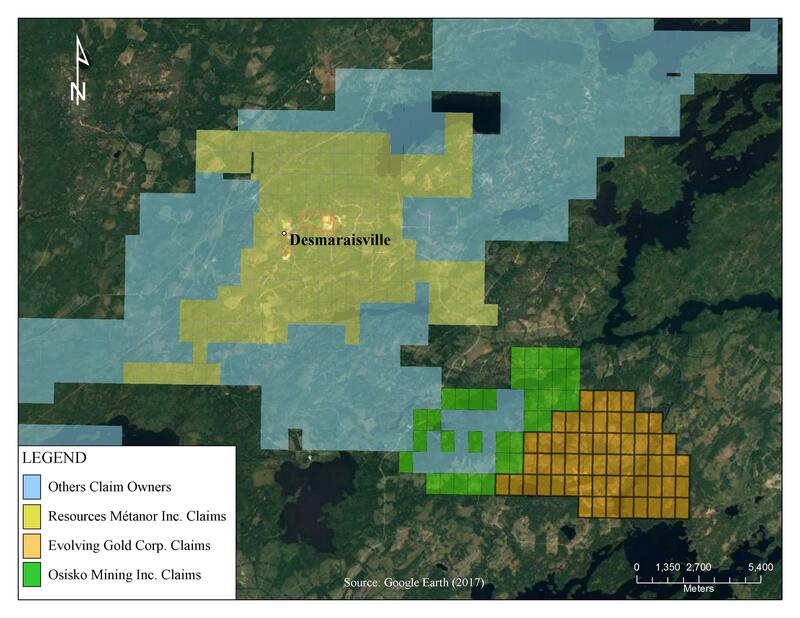 Figure 1 shows the claims owned by the Company and can be found at (https://www.evolvinggold.com/images/Figure_Desmaraisville.jpg). The 57 Nicobi claims cover 3193.05 ha (31.93 km2), and include the volcanic mafic to felsic units and synvolcanic equivalents of the Obatogamau Formation, which host a number of historic gold, copper and silver deposits and showings. Nicobi is surrounded on either side by the intrusive rocks of the Lichon pluton. Copper mineralization was found 2 km away from the Property in quartz veins and sulfide mineralization within the Lichon pluton (“Le Tac”). 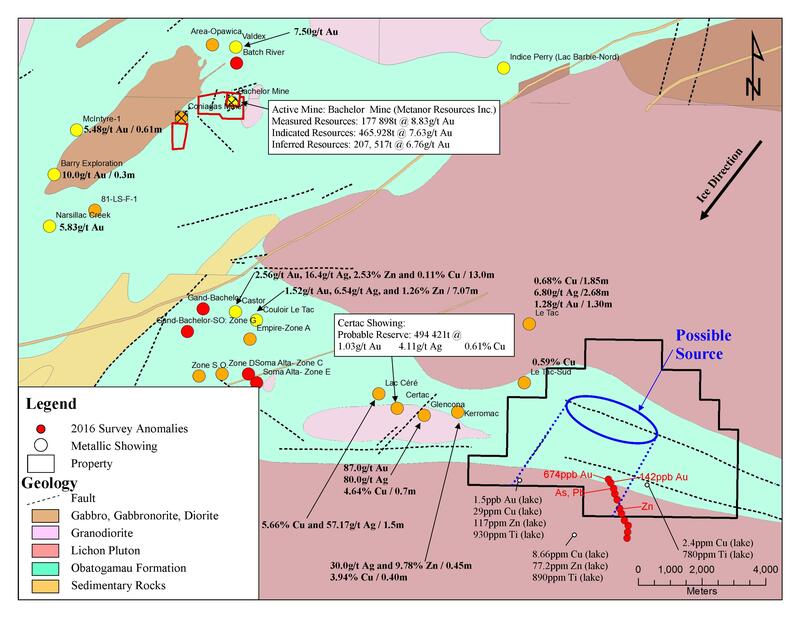 Historic gold and copper discoveries in the Obatogamau Formation just west of the Property are of either of two types: Intrusion Related Gold deposits: Kerromac, Glencona and Certac; or Volcanogenic Massive Sulphides: Lac Céré, Le Tac Sud . Less than 15km northwest of the Property is the active Lac Bachelor gold mine, hosted in the same intermediate to mafic volcanic rocks of the Obatogamau Formation found on the Nicobi Property. Two faults cross the Nicobi property in a WNW to ESE trend. They are located in the Doda shearing corridor, a major structural feature that is a component of the Casa Berardi Fault Zone. It has the potential for serving as a structural control for orogenic gold deposits as demonstrated by the Casa Berardi mine and the Vezza and Douay deposits, currently in the development stage. Hundreds of metallic showings are also associated with this Fault Zone. MERN lake-bottom surveys conducted in 2013 defined geochemical anomalies in gold, copper, zinc and titatinum down-ice from the Nicobi Property. The glacial drift direction (south) indicates that the source of those anomalous samples could be located on the Property, in association with the geological features listed above. Table 1 includes the different metallic anomalies reported down ice from the Property. The location of the metallic anomalies along with the regional claims and simplified geological features can be seen in Figure 2 at (https://www.evolvinggold.com/images/Figure_Geology.jpg). A geochemical till-sampling survey conducted on behalf of Evolving Gold in the fall of 2016, up ice and proximal to the 2013 lake-bottom anomalies, revealed various Au, Cu, Ti and Zn anomalies in till samples. Two samples which returned as much as 142 and 674 ppb of gold are contiguous and are open to the north. Multiple arsenic, copper and zinc anomalies have also been encountered in proximal samples. Evolving Gold intends to conduct further prospecting and more extensive till sampling programs on the Nicobi Property during the coming field season.